Save the Cruces Trail and Panama Canal Watershed, salvar el Camino de Cruces y cuenca del Canal de Panama. Protect Gatún Lake from saltwater intrusion, pollution and environmental catastrophe through use of safer, more efficient lock configuration, which does not create unnecessary risks to the Panama Canal system unlike the selected one for the current expansion plan, does not require building on top of active fault lines, and expose marine creatures in both oceans to extinction. The sight of waterfalls cascading out of a fissure in the new Panama Canal locks must have brought tears to the eyes of the embattled Panama Canal Authority (ACP) last August. The revelation that key components in the canal’s $5.3 billion expansion are seriously faulty has raised dozens of important questions, not least concerning safety, but the ACP is being far from transparent. Following a high-charged national referendum when pride and patriotism ran high, work to double the canal’s carrying capacity began in 2007. Now 95 percent complete, the project includes the construction of new access channels and locks to accommodate ‘Post-Panamax’ vessels, including giant super-tankers. A variety of setbacks has since plagued the project. Costly disputes with contractors and unions, alleged corruption scandals, and falling shipping traffic in the wake of the global financial meltdown of 2008 – all have damaged the ACP’s operation and reputation. The crack in the sill of the new Cocoli locks was detected during their testing and the international consortium in charge of its construction, Grupo Unidos por el Canal (GUPC), say it was caused by a design flaw. They claim that insufficient rebar rods were inserted into the walls. Photos of core samples, however, reveal an irregular honeycombed texture that is likely the result of improper concrete mixing. Nonetheless, the ACP appears to have accepted GUPC’s diagnosis – and their questionable solution. Starting in January 2016, extra rebar rods will be inserted into the lock wall and fresh concrete injected into the crack. Calling it a design flaw allows for a quicker, cheaper and shorter-lasting fix and for those responsible for the bad concrete to litigate with designers in an attempt to pass off some of the costs of their mistake to others. Jackson speculates that the collapse of the heavily government-subsidised Spanish construction company Sacyr – one of GUPC’s members along with Italy’s Salini-Impregilo, Belgium’s Jan de Nul, and Panama’s Constructora Urbana – could bring down Spain’s fragile economy. The timing could not be worse for the incumbent conservative government with general elections scheduled for 20 December. Since the discovery of the leak, news of further flaws surfaced via a memo by a US-British-Dutch consulting firm working for GUPC. According to a report published by La Estrella on 11 November, the memo cites the discovery of two new cracks in the sill. Elsewhere, unsubstantiated rumours abound of yet more construction flaws. Later in the month, during the distraction and revelry of Panama’s Independence Day celebrations, Black Friday, and US Thanksgiving, the ACP quietly admitted to Reuters that the scheduled April completion date may not be met. Some journalists have noted a remarkable lack of rigor in international media coverage, both of the fissures and the project generally. In a feature for the Panama News, Kevin Harrington-Shelton suggests that the reason may be that a timely completion of the expansion is essential for the profitable launch of new international port facilities and other global infrastructure built in its anticipation. Nations and companies are invested to the tune of $60 billion, he says. Thus the ACP may be experiencing considerable pressure to resolve its problems as quickly as possible, but this does not justify the implementation of second rate solutions – or the adoption of a public relations strategy that obfuscates more than it clarifies. Construction of the controversial Nicaragua Canal has been postponed until late 2016, prompting doubts about its future. According to a statement from the canal’s builders, the Hong Kong Nicaragua Development Company (HKND), the heavy engineering work of channel dredging and lock-building has been delayed to allow ‘fine-tuning’ of the canal’s design. Construction of the port of Brito – the canal’s planned Pacific coast terminus, also slated for development as a free trade zone – will proceed early next year, however. Doubts about the canal are grounded in wider economic uncertainty. The lion’s share of financing for the $50 billion transoceanic canal appears to have come from one man – 42-year old Chinese telecom mogul and President of the HKND, Mr Wang Jing. According to Chinese state media Xinhua, Mr Wang has invested the equivalent of half a billion U.S. dollars of his personal fortune in the project, but many analysts are now speculating about his financial standing. Earlier this year, Mr Wang was reported to have lost 84 percent of his $10.2 billion net worth due to turmoil in China’s equity market, leading Bloomberg to dub him ‘the world’s worst performing billionaire in 2015’. Following the announcement of delays, the Nicaragua canal commission sought to assuage doubts about the canal’s future. Telémaco Talavara, spokesman for the commission, informed theFinancial Times that both the commission and the HKND had secured financing from a consortium of international investors (whose identities were not divulged). Although the canal could serve as a powerful symbol of Asian ascendency, it is unknown whether the Chinese state will have a stake in it. According to the FT, the HKND are delaying construction in order to amend the canal’s design so that is ‘completely in accordance with best international practice’. The canal’s 14-volume Environmental and Social Impact Assessment (ESIA), authored by the UK-based company Environmental Resources Management (ERM), has yet to be independently analyzed. However, in March 2015, 15 environmental scientists met for two days in Florida International University’s College of Law to review four draft chapters of it. Their findings, published by Circle of Blue, identified 15 significant flaws, including one area they described as ‘scientifically indefensible’. In the words of ERM, the 276 kilometer canal will have ‘significant environmental and social impacts’. Significantly, its path is set to bisect Caribbean Coast territories traditionally held by marginalized Miskito, Rama, Garifuna and Creole peoples. The titling and demarcation of their lands – which lie within Nicaragua’s Southern Autonomous Region (RAAS) – began in 2003 as a way to devolve power from Managua to local territorial authorities, and to bolster indigenous and African-descendent land rights. As well as severely impacting their way of life, the canal will also displace numerous campesino communities which migrated to the region after the end of civil strife in the 1990s. Environmentally, the canal will impact sensitive rainforests, wetlands, and the unique ecology of Lake Nicaragua – Central America’s largest lake. Historically, the challenge of excavating a canal between the Pacific and Atlantic oceans has been fraught with drama and tragedy. In the 19th century, French efforts to build a sea-level channel in Panama descended into a mire of corruption, fraud, and tropical disease after its builder, Ferdinand de Lesseps, entirely underestimated the task. Once a national hero, he nearly bankrupted France and died in disgrace. Today, modern health and engineering advances work in Mr Wang’s favour, but those who see the canal as an opportunity for prosperity – a long time coming to Nicaragua – will be hoping that history does not repeat itself. Those who stand to lose from its construction may welcome the setback as a possible signal of the long-term unravelling of Wang’s plans. Nicaragua’s Momotombo volcano erupts... A no go for the new canal? Nicaragua's landmark Momotobo volcano has erupted for the first time in 110 years, spitting lava and sending plumes of smoke into the sky to the delight of social media users worldwide. The last time the volcano erupted was in 1905, and up until then it was one of the most active volcanoes in the country, producing 10 eruptions between 1849 and 1905. As long ago as 1610, an eruption by Momotombo forced the inhabitants of nearby León, the then-capital, to relocate about 30 miles west. In 2007, the hydrothermal system in Momotombo’s summit crater began to heat up, so this latest eruption may well be a result of nearly 10 years of magmatic activity. A crack seen in the “step”, or sill, of lockhead 3 (LH3), dividing the middle chamber from the lower chamber of the new Cocoli Lock complex on the Pacific side of the Panama Canal. PANAMA CITY (Reuters) – The expansion of the Panama canal could face a new delay due to cracks that emerged a few months ago in one of the locks, a spokesman for the waterway’s authority said on Thursday. The consortium leading the construction project – led by Italy’s Salini Impregilo and Spain’s Sacyr – expects to finish repairing the cracks by mid-January, but it has not given a new date for completing the work, the Panama Canal Authority said. The consortium is trying “to minimize the impact on the final handover, planned for April next year,” the canal authority said in a statement. 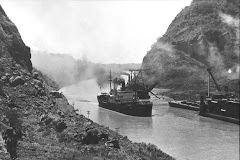 The Panama Canal’s current expansion plan was originally set at $5.25 billion but the costs rose and the administrator became locked in a dispute with building consortium Grupo Unidos Por el Canal (GUPC), which built the third set of locks. (c) Copyright Thomson Reuters 2015. Cracks Put April 2016 Delivery of Panama Canal Expansion At RiskSeptember 22, 2015In "Maritime News"
Panama Canal Expansion Timeline Still In Doubt After CrackSeptember 8, 2015In "Maritime News"
A Big Crack Threatens the Panama Canal Expansion - VIDEOAugust 23, 2015In "Interesting"
Bananama Republic - So whats up with the Canal Expansion? Burica Press - Como Avanza la Ampliación?